Alps mountaineering chaos 2 is a specially designed tent for the intermediate to experienced campers needs but can be set up and assembled by a complete novice.It is a special addition to its line by ALPS Mountaineering and is a thoroughly well designed and more importantly versatile tent. You can do a lot of things with chaos 2 model and what is more impressive is the price when you consider how much it costs in relation to other tents in the market. The mesh proof netting for the sidewalls and parts of the roof are wonderful for stargazing this coupled with the factory seal floor and fly factory seals mean that no water whatsoever will get inside the Alps chaos 2 via leakages. The interior space is a good size, you can fit two people in it with relative ease, any more than that would be a push. 2 people with additional equipment and kits would fit nicely but any more is pushing the tent beyond the limitations. Chaos 2 has a one of a kind frame system. It is a continuous pole system that connects the entire structure; this allows it to be erected with one easy motion. You don’t need to fuss with linking endless poles together but this pole system just lifts up and snaps into place, its completely freestanding and very impressive. This tent also features elastic cord ties that add to the further supportive structure and make it one of the tightest and strongest around. The poles on chaos2 tent are all shock corded and linked to this unique continuous system frame which is absolutely outstanding around. This means even in the harshest of weather conditions this rugged design effective and cape able freestanding structure will not fall down. The extra large #8 zippers on the vestibules and doors are non-catching meaning they won’t break and they are sure to stand the test of time. Chaos 2 tent is for the serious camper, this is a seriously one of the best 2 person tent and it demands respect. The sheer ruggedness and way that this tent can deal with rough terrain and conditions make it one of the best around. It’s also very practical and you can do a lot with it. You can have your family use it for simple fishing trips and also for an around the world excursion and know that wherever you are this tent is going to handle whatever conditions you throw it. Like with all the products coming from alps mountaineering the color scheme for this tent is basic but effective and very stylish. It uses a dark clay/ rust color for the outer fly wall and layer which is great because it can blend in nicely to any surroundings; the mesh like all meshes is black and is a no-see-um style. This ensures that people cannot see easily inside the tent from the outside. Earth tones like this are great for tents because they let you slip into the wilderness wherever you are and let you become one with nature. Unique continuous pole system, allows for great sturdiness and easy set up. Through design and very difficult to break down. Resistant to all types of weather and can be used in all climates. Easy clip-on system and simple to set up and break down. Two door access and great storage. Mesh walls mean you have to be vigilant with the weather, if the outer fly isn’t up you get wet. Storage vestibules could be a little bigger. Low ceiling, a taller camper is going to have trouble being in the tent for a long term excursion. 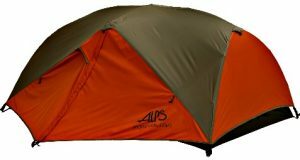 Alps mountaineering chaos 2 review says it is a great tent if you know what you are doing out there. It is rugged and big enough for 2. Has a great design and is in our opinion of the better looking tents on the market. It is rugged and tough, definitely one of the strongest tents to resist all types of weather.